Handling pressure is a skill. It is a skill prized in C-level executives. Executives who know how to perform well under adverse conditions are not only successful in their careers, driving organizations onwards and upwards. They also naturally become great business leaders. How do they do it? A common denominator for successful executives is their ability to embrace the stress of their jobs. After all, there is no such thing as a stress-free work life. Executives, in comparison to average workers, deal with stress by turning a highly pressurized situation into a challenge—a fun one at that—rather than a threat. C-level executives achieve peak performance because they are comfortable in high-stress situations. Nothing outside of what they can control will distract them. When things go sideways, as they sometimes do in business, they get up and move on. They rarely (or never) indulge in self-flagellation. And they have an ability to switch off from what went on during the day to switch on to another endeavor—a crucial skill that prevents burnout. 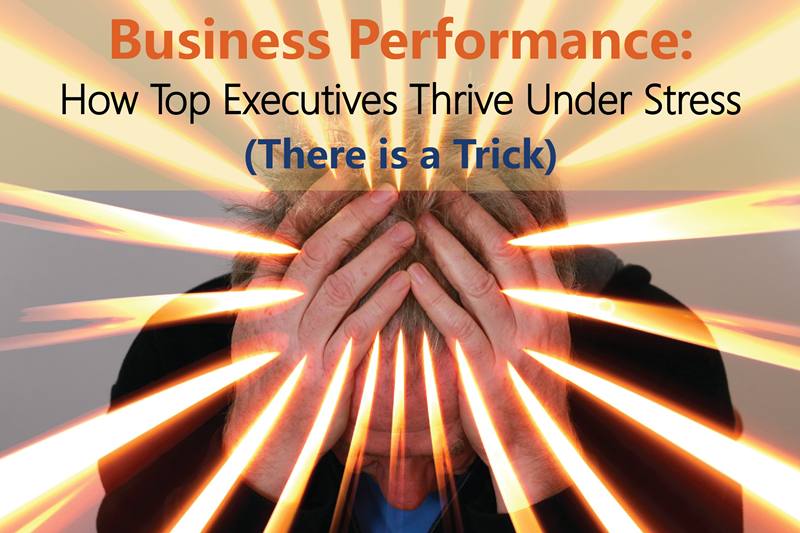 Top executives are able to perform well under stress not merely through brainpower. According to the Harvard Business Review, it takes physical endurance, followed by emotional capacity, topped by mental capacity, and then finished off with spiritual drive. When all of these things work together, C-level executives can make tough decisions amid adversity. Dealing with stress can be learned. Top executives don’t start out mastering highly pressurized scenarios. They hone this skill and follow routines. Meditation plays a crucial role in helping executives manage the impact of stress. They focus on what is happening in the here and now. They tune into their senses. And they practice deep breathing. Executives may make difficult decisions every day, sometimes with little information. But they rarely jump to conclusions (or not at all). In a fast-paced environment, C-level executives know how to slow down. This allows them to get creative when formulating a plan. This also ensures that they don’t miss out on significant information. The ability to focus on what can be controlled is what makes meditating a crucial aspect of thriving under stress. The goal of this practice is to allow successful executives to prioritize factors that they can control. Finally, when not meditating, music provides relief from thinking and worrying. Music has a tremendous effect on physiological and emotional wellbeing. It prompts a shift in the brain, from the rational left to the intuitive right. Also, music allows executives (and you) to direct energy, boosting it when it’s time to perform and ebbing when it’s time to decompress.